The first season of the Thaj Archaeological Project took place from October 25 to November 30 2016, under the supervision of M. al-Hajiri (SCTH), J. Rohmer (CNRS) and A. al-Jallad (Leiden University). The team included 10 members from European research institutions and 8 Saudi members from SCTH. This campaign was carried out thanks to the financial and technical support of the French Ministry of Foreign Affairs, the Oosters and Juynboll Foundations (Netherlands) and Éveha International – Etudes et valorisation archéologiques. a Digital Surface Model (DSM) giving a precise representation of the topography of the site. a global orthophotography of the site, which make it possible to see, to locate precisely and to draw all the ancient walls appearing on the surface. Based on this picture, the plan of whole neighbourhoods of the ancient city can be drawn. 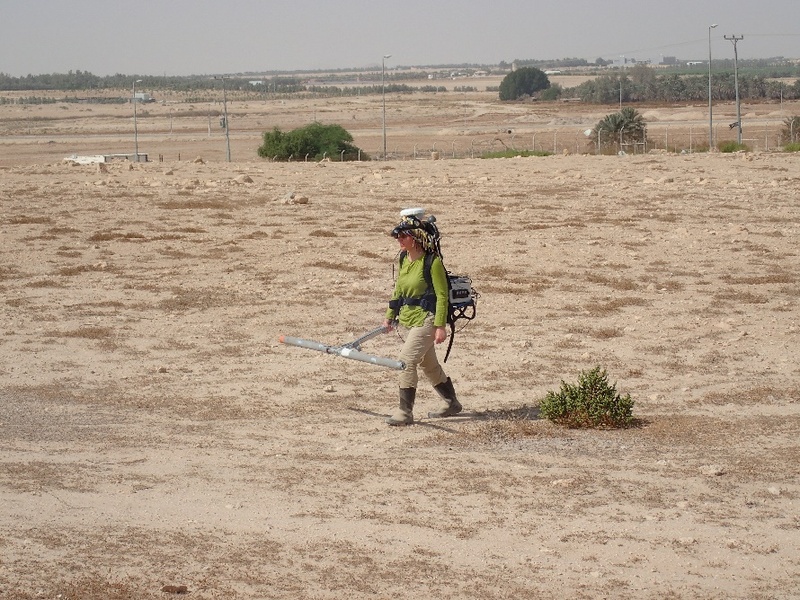 In order to understand the palaeo-environement of the site, a geoarchaeological study of the Thaj area was carried out by Prof. K. Pavlopoulos (Sorbonne Abu-Dhabi) and T. Beuzen-Waller (PhD student, Paris-Sorbonne University) from Nov 12 to Nov 18 2016. 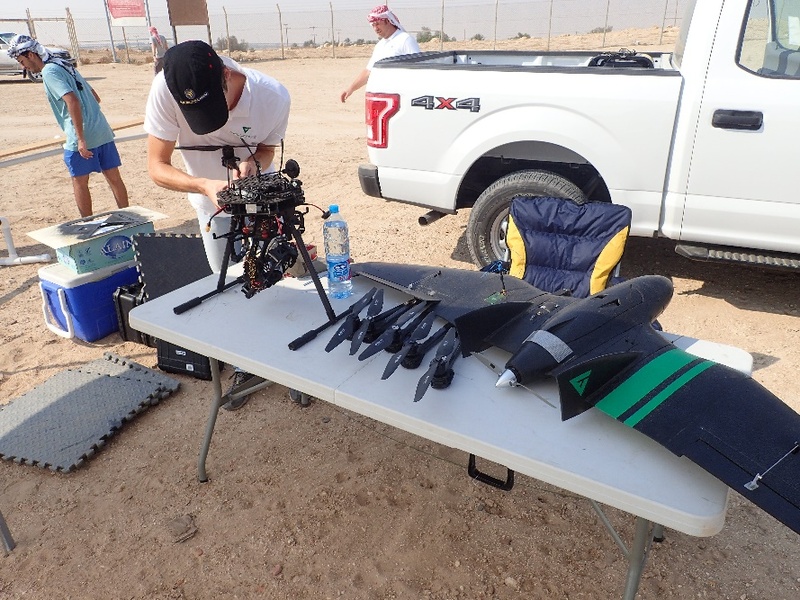 It consisted in preliminary surveys, satellite imagery analysis, fieldwork mapping and three soundings in the main sabkha. The geomorphological and archaeological sites were located by GPS and integrated into a GIS. The bibliography concerning the geological and hydrogeological characteristics of the area was summarized. The results shed new light on the geomorphology of the Thaj area and on its hydrogeological/hydrological conditions (see map below). 30 soil samples have been taken in the soundings and will be exported to France for analysis. They will enrich our knowledge about the water table fluctuations and variations of the sabkha banks during late Holocene period. the palmgrove north of the modern village, corresponding to the northern third of the ancient walled city. The data still need post-treatment in France but the preliminary results are excellent, especially in the southern part of the city where the network of the streets appears clearly. Unfortunately, the modern metallic fence creates a magnetic perturbation which masks the city wall. In the northern part of the city, the map is less clear but the survey allows to locate the northern corner of the city wall. 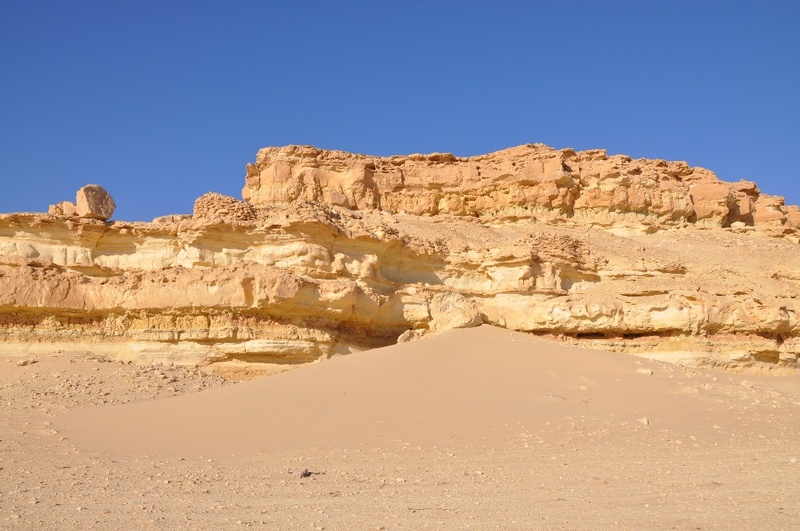 The survey team led by A. al-Jallad surveyed the sites immediately surrounding Thaj and as far away as Hazm Abu Shaddad, approximately 40km to the south and the rocky outcrops northwest of Ṣarrār. 41 sites in total were identified. The closest major sites are the three battīl’s, al-janūbī, al-awsaṭ, and al-šamālī. Battīl al-awsaṭ yielded a significant amount of pottery similar to that of Thaj and burials at its base. Cairns, other stone structures, and burial mounds are abundant in these areas. Hazm Abu Ṣarrār is the next major site to the south. It lacked any pottery but was abundant in ringed cairns and other types of burials. See Inscriptions and Rock Art for a report on the findings from this area. To the north of Thaj is Jebel Quwaydiyat. It contains the ruins of fortifications on a terrace approximately midway between the base and summit. Pottery is abundant and some samples were brought back for study. It is unclear if Quwaydiyat is connected to the settlement of Thaj. Further north near Ṣarrār is a group of rocky outcrops. Two of these had fortifications similar to Quwaydiyat and significant pottery scatters at their base. This pottery is distinct from the kind found at Thaj and seems to date to a later period, perhaps Abbasid. Rock art is not abundant in this area, but one Thamudic inscription was found. 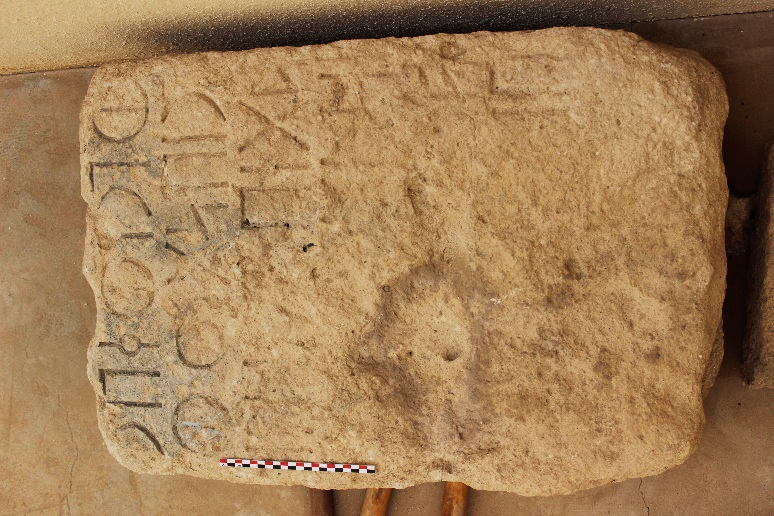 One new Hasaitic gravestone was discovered in the repository of the dig house and two fragments. The Hasaitic-Aramaic inscription published in Al-Wohaibi 1980 had been covered by mud and water. The team excavated it and carried out an extensive study of the rock, producing the most accurate drawings and photographs to date. 40km south of Thaj, two three Thamudic graffiti were discovered among a great amount of wusum and modern Arabic inscriptions. These panels also contained a few examples of rock art, most of which appears to be modern. A carving of a warrior with a curved sword and perhaps a spear or bow is likely pre-modern. These were all meticulously recorded. In a cave 40km north of the site, near the fortified mountains mentioned in the region survey, a single Thamudic inscription was discovered. In a cave 40km north of the site, near the fortified mountains mentioned in the region survey, a single Thamudic inscription was discovered. Based on the preliminary analysis of the aerial photographs and of the geophysical map, two excavation areas were opened. 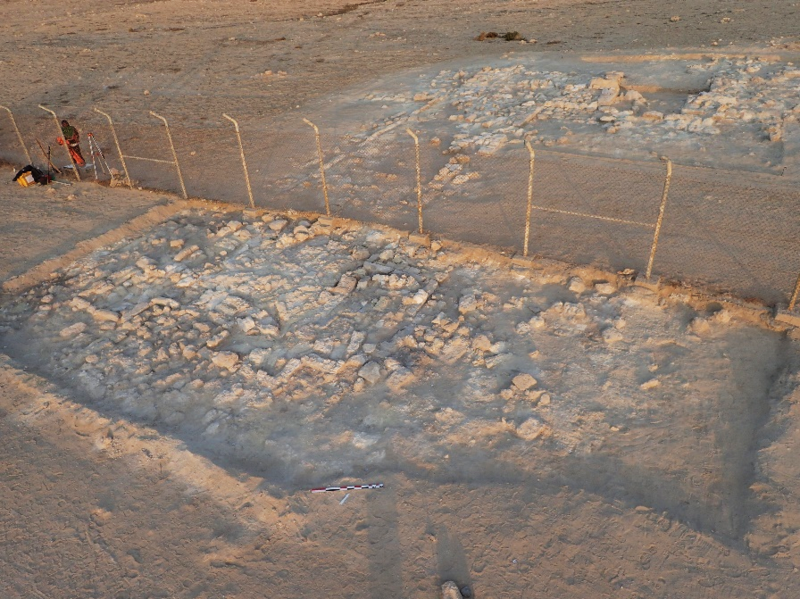 Area 1 was opened in the south-eastern fenced area, where massive architectural remains appeared on the surface. 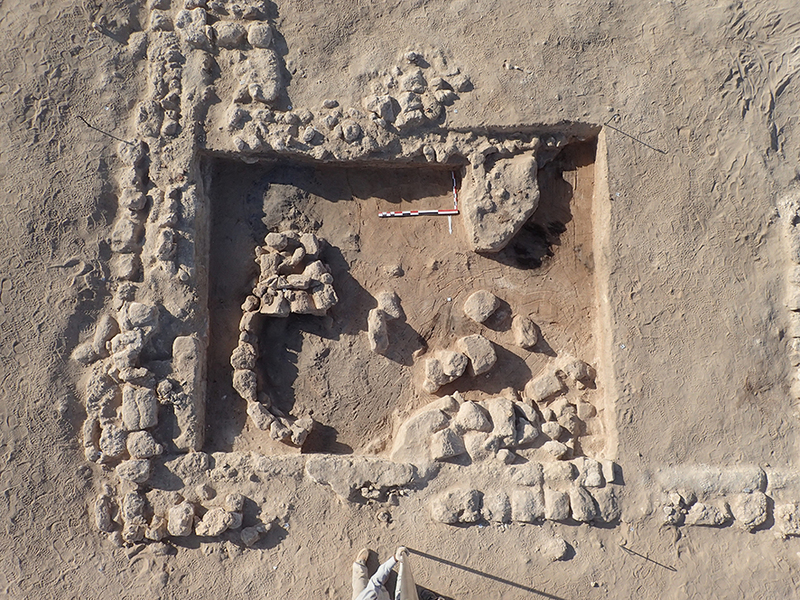 The excavations were supervised by Dr. Damien Gazagne (Eveha company), with the participation of Azhar al-Toubi (SCTH), Hassan Hamdoon (SCTH) and Chiara Della Puppa (Leiden University), from Oct 31 to Nov 24. The first two weeks were devoted to wide horizontal exposure. An area of 600 sq. 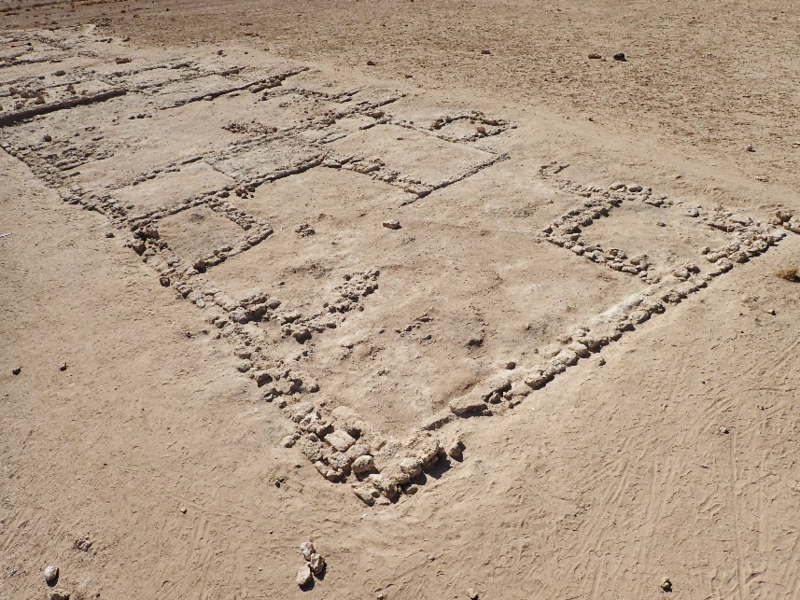 m, corresponding to the half of an ancient city block, was uncovered. Then, two deep soundings were opened. The first sounding, in the north, revealed a stratigraphy of 1.80 meters, with a succession of occupations and two major architectural phases. The second sounding, carried out by Azhar al-Toubi and H. Hamdoon from Nov 15 to Nov 24, revealed a potter’s kiln. The area therefore seems to be an ancient industrial area. Area 2 corresponds to a gate in the southern city wall, which was identified on the aerial photography. It is located ca. 170 m from the SE corner. 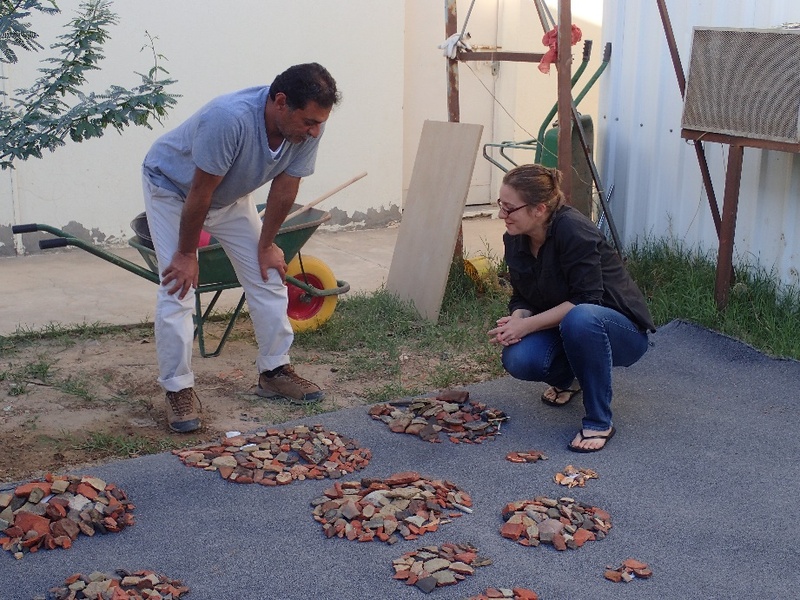 It was excavated under the supervision of J. Rohmer, with the participation of Hassan Hamdoon and Chiara Della Puppa. Wide horizontal excavations allowed to expose the plan of the gate and of an impressive defensive tower protruding 15m outside of the city wall. A 7x2m sounding was opened along the tower to check the existence of an outer gate – which was not found. The pottery from the excavations was studied by Dr. Caroline Durand (CNRS). She identified several types of local pottery and different imports (Mesopotamian glazed ware, bitumen-coated amphorae, Indian red-slipped pottery). The pottery was drawn and photographed by Laetitia Munduteguy (independent draughtsperson).